What Does the US Military See as Its Greatest Threat? China’s activities in the South China Sea are prominently featured in the Pentagon’s latest strategy document. Today, the Pentagon released a new national military strategy that warns that the United States’ comparative military advantage has begun to erode due to a more conflict-prone international system that includes revisionist states that are undermining transregional security as well as violent extremist organizations. 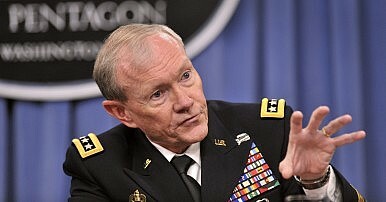 The highest-ranking U.S. military officer, Chairman of the Joint Chiefs of Staff Martin Dempsey, notes in the document’s introduction that since the publication of the last National Military Strategy in 2011, “global disorder has significantly increased”. “We now face multiple, simultaneous security challenges from traditional state actors and transregional networks of sub-state groups – all taking advantage of rapid technological change. Future conflicts will come more rapidly, last longer, and take place on a much more technically challenging battlefield,” he additionally underlines. The strategy notes that the United States is attempting to deter, dissuade and – if need be – defeat potential state adversaries, while simultaneously pushing to degrade and defeat violent extremist organizations across the globe. Despite these changes, states remain the international system’s dominant actors. They are preeminent in their capability to harness power, focus human endeavors, and provide security. The document specifically lists four states that in one way or the other threaten America’s national security: Russia, Iran, North Korea and China. “None of these nations are believed to be seeking direct military conflict with the United States or our allies. Nonetheless, they each pose serious security concerns which the international community is working to collectively address by way of common policies, shared messages, and coordinated action,” the strategy says. It goes on to list the specific nature of the challenges posed by each individual state. China’s actions are adding tension to the Asia-Pacific region. For example, its claims to nearly the entire South China Sea are inconsistent with international law. The international community continues to call on China to settle such issues cooperatively and without coercion. China has responded with aggressive land reclamation efforts that will allow it to position military forces astride vital international sea lanes. The strategy also elaborates on the changing nature of warfare, discussing, for example, the concept of hybrid conflicts. It also highlights how the diffusion of military technology will make it more difficult for the United States military to maintain its technological edge. There are good reasons why the rhetoric from Moscow is harsher than Beijing’s. For a start, China knows lashing out at the U.S. is counterproductive.